A powerful bike needs a skilled rider. It’s a place where you can benefit from our years of experience and highly skilled teaching. Access to our world-class equipment will get you ready to take on the road and make the most of the whole Honda range with a nationally recognised licence. Register online today and we’ll make getting your hands on a new, more powerful, bike even easier. Our qualified instructors can get you up to A2 or A standard. That means a lot more choice when it comes to your ride. 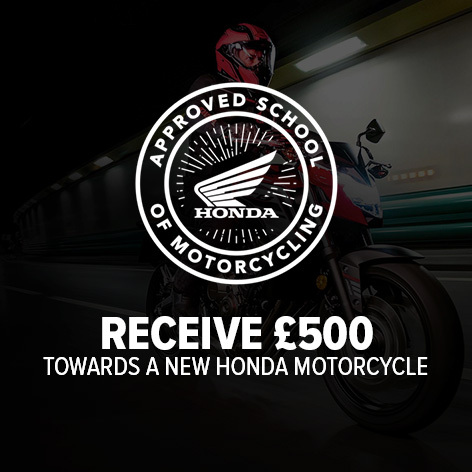 If you register now and pass a step-up course, not only will you get a nationally recognised licence, but we’ll give you £500 towards a new bike.